Findings in these inspections do not present a complete picture of the quality of care provided. Information in this database should be interpreted carefully and used in conjunction with other sources, as well as a visit to the nursing home. We suggest you use our Nursing Home Checklist to help evaluate the nursing homes you plan to visit. Failed To: Review or revise the resident's care plan after any major change in physical or mental health. Failed To: Allow residents the right to participate in the planning or revision of care and treatment. Failed To: Provide necessary care and services to maintain or improve the highest well being of each resident . Failed To: Make sure that residents receive treatments/services to maintain or improve their ability to care for themselves. Failed To: Give residents proper treatment to prevent new bed (pressure) sores or heal existing bed sores. Failed To: Ensure that each resident who enters the nursing home without a catheter is not given a catheter, unless medically necessary, and that incontinent patients receive proper services to prevent urinary tract infections and restore normal bladder functions. Failed To: Ensure that residents with limited range of motion receive appropriate treatment and services to increase range of motion or prevent further decrease in range of motion. Failed To: Give each resident enough fluids to keep them healthy and prevent dehydration. Failed To: Ensure that each resident's 1) entire drug/medication regimen is free from unnecessary drugs; and 2) is managed and monitored to achieve highest level of well-being. Failed To: 1) Provide 3 meals at regular times; 2) serve breakfast within 14 hours of dinner; and 3) offer a snack at bedtime each day. Failed To: Provide routine and emergency drugs through a licensed pharmacist and only under the general supervision of a licensed nurse. Failed To: Have a program that investigates, controls and keeps infection from spreading. Failed To: 1) Review the work of each nurse aide every year; and 2) give regular in-service training based upon these reviews. Failed To: Set up an ongoing quality assessment and assurance group to review quality deficiencies quarterly, and develop corrective plans of action. Failed To: Ensure that a nursing home area is free from accident hazards and provide adequate supervision to prevent avoidable accidents. Failed To: Give residents a notice of rights, rules, services and charges. Failed To: Immediately tell the resident, the resident's doctor, and a family member of situations (injury/decline/room, etc.) that affect the resident. Failed To: Tell the resident or the resident’s representative in writing how long the nursing home will hold the resident’s bed in cases of transfer to a hospital or therapeutic leave. Failed To: Conduct initial and periodic assessments of each resident's functional capacity. Failed To: Make sure that doctors visit residents regularly, as required. Failed To: Make sure that a working call system is available in each resident's room or bathroom and bathing area. These deficiencies resulted from complaints investigated by the state inspectors and substantiated. Failed To: Use a registered nurse at least 8 hours a day, 7 days a week. 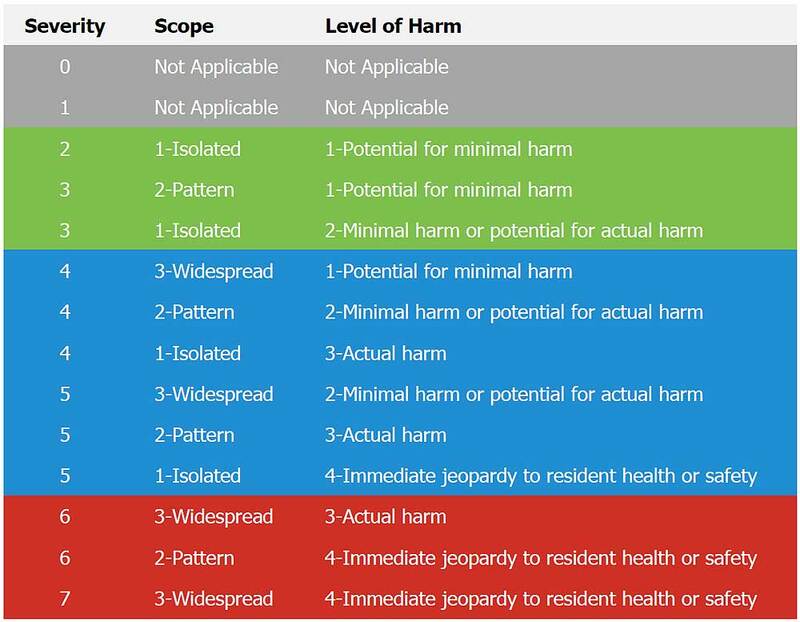 Severity = Scope + Level of Harm. Then, we add up all of the severity ratings to get our final Deficiency Rating. Nursing Homes that are Medicare and/or Medicaid certified are licensed by the state in which they operate and are required to comply with rigid standards enforced by regular facility inspections and extensive evaluations. The state inspection deficiencies provided here are accounts reported by state inspectors of every discrepancy found where the home failed to meet the minimum standards set forth by state and federal regulations. If a home does not show any deficiencies, it has met the minimum standards required. Be sure to examine the full descriptions provided under the Detailed Report. Some deficiencies may be more critical than others based upon the type. For example, administrative deficiencies may be less important to you than mistreatment or quality of care deficiencies. State inspection details provide useful information that can help you compare nursing homes in your area and decide what types of questions you may want to ask when you visit the nursing home. Note: Every attempt is made to assure that the most recent survey results are available on this website. Surveys are generally conducted every 9-15 months, however, all homes are not inspected each year. This area shows the average number of staff hours worked each day by RNs, LPNs/LVNs and CNAs divided by the number of residents. This is a good measure of the trained medical staff available, on average, for comparison purposes. The number of hours worked per patient is a relative statistic for comparison between different homes as well as County and State averages. Although more hours per patient should mean better care, there are no measures for the individual care received by any given patient and the quality of care provided may be more a factor of training and dedication than the number of hours worked. Each nursing home reports the staffing hours for a two-week period prior to the time of the state inspection. Hours per resident per day is the average amount of hours worked divided by the total number of residents. It does not necessarily show the number of nursing staff present at any given time, or reflect the amount of care given to any one resident. The Centers for Medicare and Medicaid Services requires nursing homes to have enough staff to give adequate care to all residents. There is no current federal standard for optimal nursing staff levels, although federal law requires all nursing homes to provide enough staff to adequately care for residents. The nursing home must have at least one RN for at least 8 straight hours a day, 7 days a week and either an RN or LPN/LVN on duty 24 hours per day. Certain states may have additional staffing requirements. These numbers are for reference only. Some nursing homes might require more nursing staff due to the conditions of their residents and other factors such as whether the nursing home has special care units. This deficiency has the potential for causing no more than a minor negative impact on the resident. Example: The nursing home's statement of deficiencies was not posted, nor was there any sign indicating where it was. The nursing home keeps the statement of deficiencies in the business office and shows it to residents upon request. This deficiency results in minimal discomfort to the resident or has the potential (not yet realized) to negatively affect the resident's ability to achieve his/her highest functional status. Example: Staff were observed not washing hands properly between resident treatments. There is no evidence of the transmission of infection between residents by staff. This deficiency results in a negative outcome that has negatively affected the resident's ability to achieve his/her highest functional status. Example: A resident was "active and vocal" on admission to the nursing home. The nursing home restrained the resident 6 months ago, despite the lack of medical symptoms for doing so. The resident is now withdrawn, does not attend activities, and is "down in the dumps." This deficiency places the resident in immediate jeopardy as it has caused (or is likely to cause) serious injury, harm, impairment, or death to a resident receiving care in the nursing home. Immediate corrective action is necessary when this deficiency is identified. Example: A resident with dementia was found outside during an inspection, heading toward a nearby highway. The nursing home had no working system in place to monitor residents with dementia. This deficiency potentially or actually affects a few residents. Example: 60 of 70 residents in the nursing home are incontinent. The nursing home failed to provide adequate care of services to restore or improve bladder function in 2 of these residents. This deficiency potentially or actually affects some residents. Example: 60 of 70 residents in the nursing home are incontinent. The nursing home failed to provide adequate care of services to restore or improve bladder function in 10 of these residents. This deficiency potentially or actually affects many residents. Example: 60 of 70 residents in the nursing home are incontinent. The nursing home failed to provide adequate care of services to restore or improve bladder function in half of these residents. This information will allow comparisons to be made among nursing homes about the proportion of residents with a particular condition. In addition, it can be used to help you decide what type of questions you may want to ask when you visit the nursing home. This data alone should not be used to make a decision. It is important to use these numbers only as a starting point. High or low percentages may be the result of factors other than quality. Percentages for a particular measure may vary widely among nursing homes. You should plan to visit the nursing home before making a decision. In addition, you should use this information in conjunction with the state inspection results found in the "About State Inspection Deficiencies" section of this report. It is important to note that these characteristics are reported by the nursing home and are not audited. This information is collected through the inspection process and is reviewed by nursing home inspectors. Medicare pays for some nursing home care in specific situations and for no more than 100 days for each benefit period. A benefit period begins the day you go to a skilled nursing facility. The benefit period ends when you have not received skilled nursing care for 60 days in a row. Medicaid pays for long term care for people with low incomes and resources. Check out with your State Medicaid Agency for the income levels in your State. If a nursing home does not participate in the Medicaid program and does not accept Medicaid patients, and the resident runs out of other funds/coverage, the resident will have to move to another nursing home if he/she wants to be on Medicaid. Nursing homes can be run by private for-profit corporations, non-profit corporations, religious affiliated organizations or government entities. Quality can vary in nursing homes within each of the different types of ownership. Each nursing home needs to be judged on its own merits. The nursing home is affiliated with a hospital. Often if a home is located within a hospital setting, it usually provides short-term rehab only. Resident and family councils can facilitate communications with staff. The law requires nursing homes to allow councils to be set up by residents and families. If a nursing home does not have a resident and family council, ask the Administrator why. Ask to talk with council presidents to get a sense of how the nursing home has acted on their concerns. This measure represents the total number of Medicare/Medicaid Certified Beds in the nursing home. Some nursing homes can have a combination of Medicare, Medicaid, and/or private pay beds. Please check with the nursing home to find out what types of beds are available. This number tells you how many residents in Medicare/Medicaid Certified Beds were living in the nursing home at the time of the inspection.